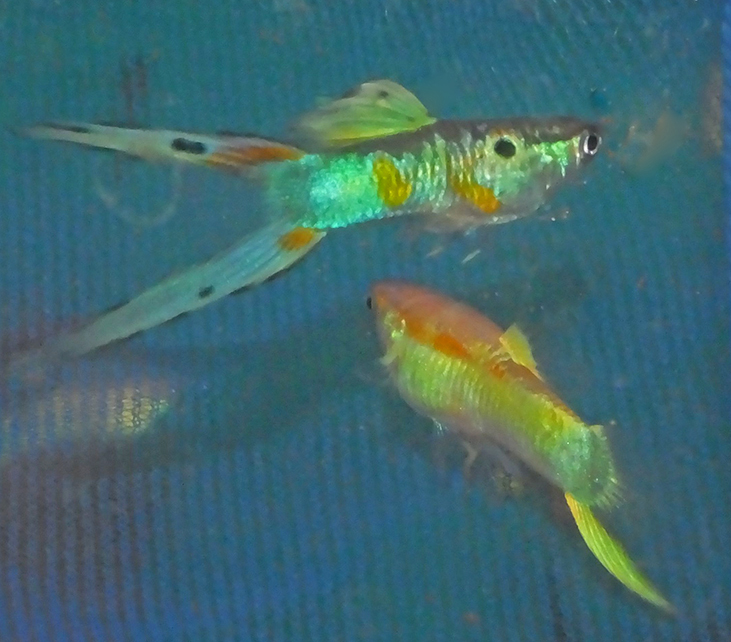 Once I started sending fish to shows, every problem in my breeding program was exposed. LOSING is a strong motivator. You either up your game and improve, or you give up in frustration. It’s been a busy couple of weeks. I relocated my fish room to a bigger room in the house. I then added another wall of shelves, which will allow me to expand as necessary. I reduced the number of lines of fish I had. Then counted 22 lines of fish (yikes), and reduced again. I culled back the number of fish per tank. I realized my overcrowding wasn’t giving my fish the space to grow to show size. Within a week or two, I’ve already seen fast gains in size just due to fewer fish per tank. A lot of my better lines were already fairly decent and could be good entries in the IFGA in the future, they’re just still young fish. I’ve probably picked the brains of at least 8 consistent IFGA winners to pinpoint all my problem areas lately. I also invested in some new stock (deltas) to make sure I have the best possible lines to work with for 2015. Overall I’ve been working on simplifying, reducing the number of lines, along with improving size and quality. 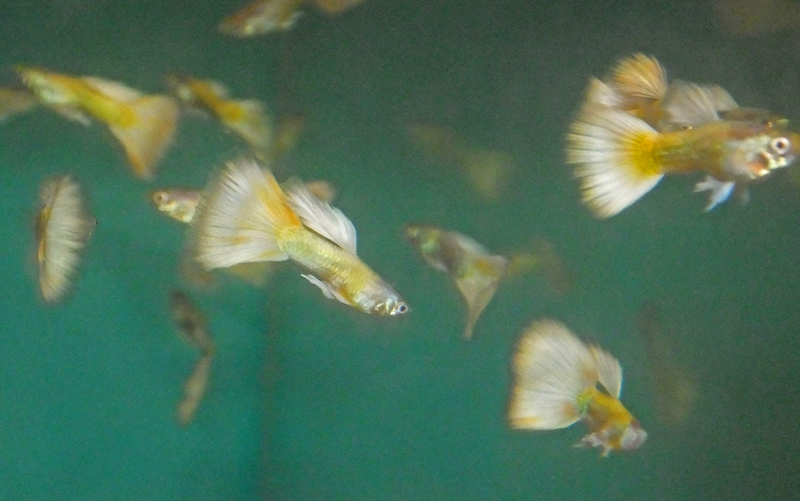 When you show guppies, you’re always working up to a year in advance. So you work hard now, in order to do well a year later. That’s the hard part of it. You have tanks of fry that don’t look like much, but you have to act like each fry is a potential award winner in order to give them the care they need. It hasn’t all been bad news. (It sure seems like it though!) The lower sword pictured below won first place (Novice Sword/veil) at the Pan Pacific guppy show in Los Angeles. 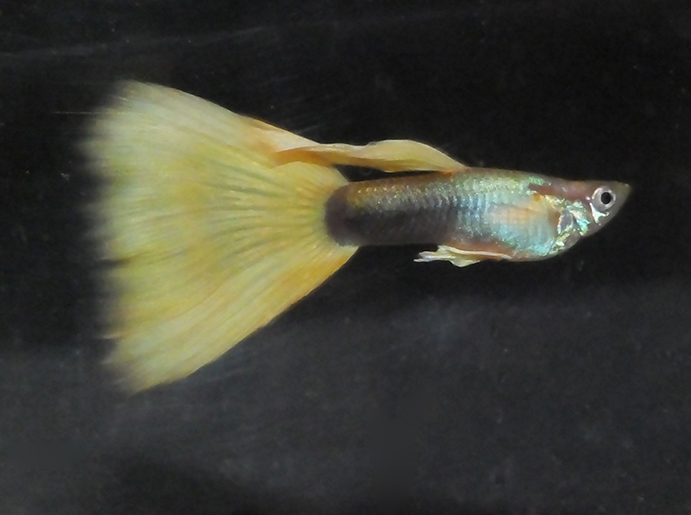 He then won first place at the Gateway Guppy Associates show in St. Louis. I decided to pull him out as a breeder, since the judges have spoken. 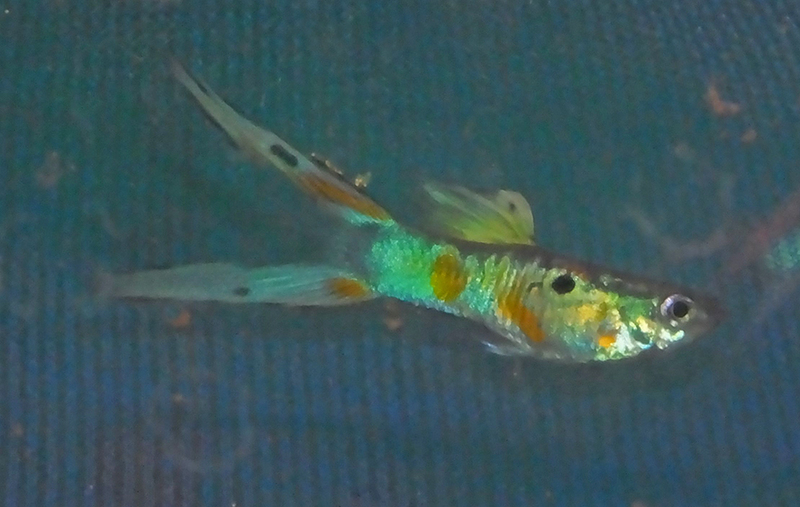 Then another swordtail of mine won first place in the Novice Sword/veil category at the Michigan Guppy Breeders. The problem is that I’ve been accumulating points from my lower swords. And there’s a pretty good chance that if I send a couple more sword entries to the next show, I’ll move into second place in the overall Novice category. There’s no way I can win first place in the overall Novice category because I’m too far behind. So I’m only sending one fish later this month for the sword/veil category to hopefully place well and at least “show up for competition.” And I can still consider entering fish in the non-novice categories. If I win first or second in the overall Novice category for the year, I won’t be able to enter as a novice again in 2015. So staying in 3rd or 4th place gives me the options of entering both regular classes and novice classes for another year. It’s a long story, but this female (below) has her own tank most of the time. She’s a solid snakeskin (meaning, the males have a snakeskin pattern on the body and solid color dorsal and caudal), and I’m working on an outcross that I HOPE results in some good show quality fish. She’s looking super healthy and could drop some fry in the next couple of weeks. Fingers crossed. I had some lines of HB yellows from when I was trying to develop a line of yellows. (They’re often used to maintain yellows.) But my yellows were culled when I was cutting down on my number of lines. 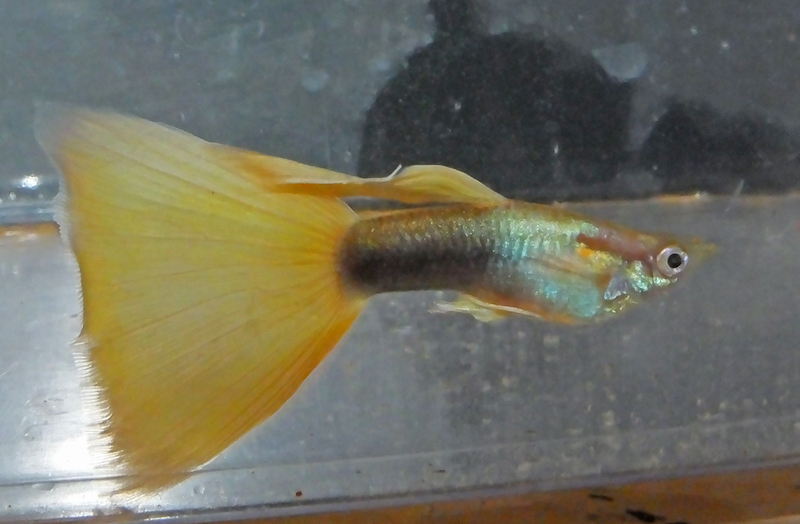 This male has problems in terms of being competitive in the HB yellow class, but I still like the way he looks. I’m hoping his offspring develop into nice fish. I might need to get ahold of some Gary Mousseau HB yellows at some point to improve the line. I would say a Mousseau HB yellow is almost impossible to beat on the bench (he has vastly more experience, more tanks, and more lines than anyone with these fish). But hey, there’s always 3rd and 4th place to dream about. Weeks ago, I noticed a couple AOC deltas were showing up with ORANGE on their caudals. I started putting them in their own tank, which quickly filled up. I don’t think I’ve ever seen an orange guppy that actually looked like a real orange. I think due to the white in these fish, it’s giving a good background for the orange coloration. To me, it looks like a real orange. Whenever I see a pale “red” delta, it looks like a weak orange to me. But this is a real orange. (i.e., what an orange looks like rather than a tomato looks like.) 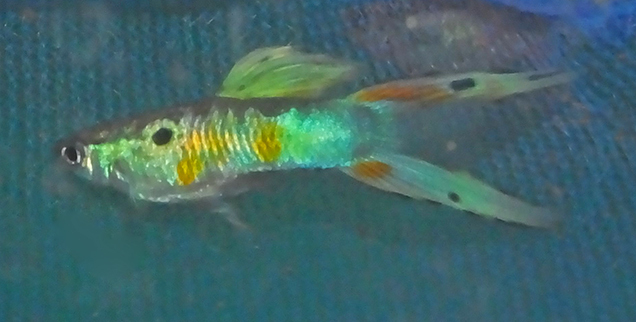 I can’t ever remember seeing a true orange guppy. That’s part of my fascination for these. 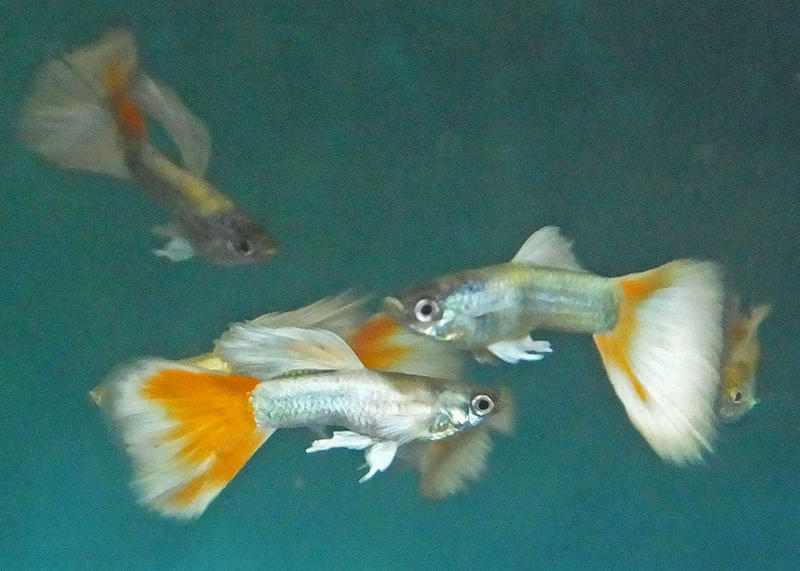 I could keep them as “creamsicle” guppies, or take the ones with the most orange and push it further. These also kind of remind me of the koi guppies I’ve seen from some Asian and German breeders, but without orange on their bodies. It’s possible this orange is due to my water. Simeon Bonev originated this line, and he says he has never had this color combination appear. 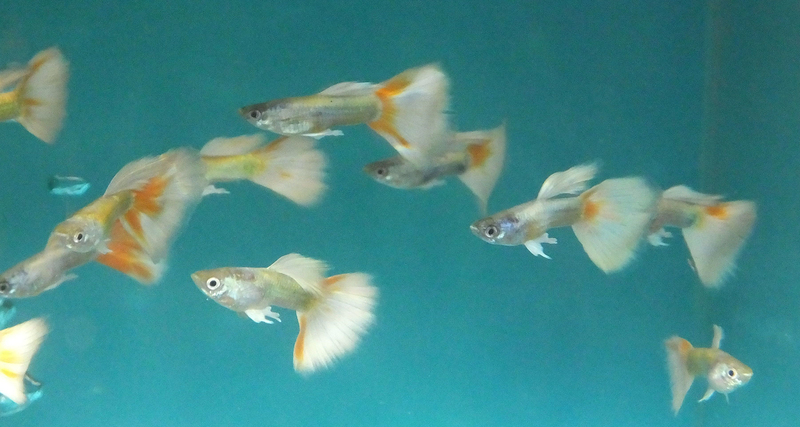 AOC guppies, siblings of the creamsicle guppies above. But minimal or no orange. This is a young doublesword. 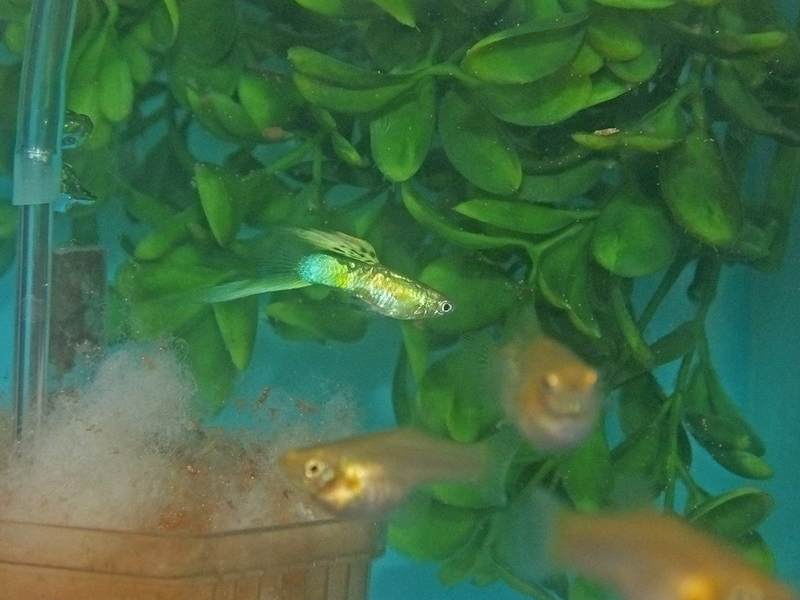 The fish in the lower right corner is a young Stoerzbach lower sword.